My paternal grandmother always makes these for Christmas. Mix together sugar, baking powder, hartshorn powder and flour. Add soft butter and mix until crumbly. Add egg, milk and cardamom essesnce and knead until smooth. Store in a refrigerator until cold through (overnight is usual). Flatten with a rolling pin and cut out cookies with a glass or circular cookie cutter. Put about a teaspoonful of jam in the center of each cookie, fold cookies in half and press edges together with a fork. Arrange on a lightly floured baking sheet and bake at 200°C for 7-10 minutes, or until golden. I don't particularly care for these, as I don't like raisins in food and the currants remind me of them, but my grandmother loves them. Cream sugar and butter, then add the egg yolks one by one, mixing well in between. Gradually add the flour, then the lemon essence. Whip the whites separately until stiff and fold into the dough. Put the doughonto a baking sheet and spread evenly over the sheet, using a spatula. Sprinkle a mixture of currants, almonds and sugar on top. Bake at about 180°C until golden and cut into squares while still warm. While technically they are everyday pastries, I think kleinur deserve to be included in the Christmas fare. I have added a second recipe for those who do not have access to hartshorn powder. In many homes in Iceland a large cooking pot lurks in a kitchen cupboard. Its sides are black with burnt-in fat, and a guest might wonder what the monster is used for. Occasionally, in some homes as often as once a week, this pot will be pulled out from its hiding place and put to good use for frying doughnuts in. It is not unusual for a doughnut-maker to make a double or even triple recipe in one session. Twisted doughnuts are not a specifically Icelandic phenomenon, but neither are they as common in other countries. Making these delicacies is time consuming and hard work, and therefore the batches are usually large to save time and effort. I don’t know who Siggi is or was, but the recipe is for dry chocolate chip cookies that can be stored for several months. It is one of three types cookies my mother always makes for Christmas. They are excellent dipped in coffee. 1/2 cup chopped nuts. My mother uses hazelnuts, but I bet it would also be good to use cashews, peanuts or macadamias. I made some liver sausage with a friend of mine yesterday. This is a popular Þorri food that is available year round in Iceland. It is the season for making liver and blood sausages right now. There are many ways of preparing liver, and the following is one method of preparing a good, nutritious meal from lamb's liver. This delicacy has relatives in various other countries. The most famous is do doubt the Scottish Haggis. This is an original traditional recipe. Below the instructions you will find a tip on how to make it lighter and healthier. Pork liver can be substituted for lamb's liver, and beef suet for the mutton suet, but for genuineness, you need lamb's liver and suet. A friend and I meet for lunch a couple of times a month, and recently we decided to try a new restaurant or café once every month, instead of always going to one of the same three places over and over. This month’s choice was Jómfrúin, a Danish-style smørrebrød (open-faced sandwiches) restaurant in Lækjargata in the heart of Reykjavík. Neither of us had eaten there before, but I have eaten party food from them on several occasions (at my workplace we sometimes order canapé versions of these bread dishes to serve to special guests). The place is small and bustling with activity. The environment is in the plain café style, with old Danish advertising posters on the walls, dim lighting and paper tablecloths. The floor is tiled and there was too much noise in there for us to have a quiet conversation. The service was fast, efficient and friendly. In Iceland, the last Monday before Lent is called Bolludagur, or Bun Day. On this day, we stuff ourselves with delicious, sweet buns, and many families eat meatballs or fish balls for dinner (bolla can mean both "bun" and “ball”). Two kinds of buns are made, one recipe uses yeast for rising, the other uses eggs. 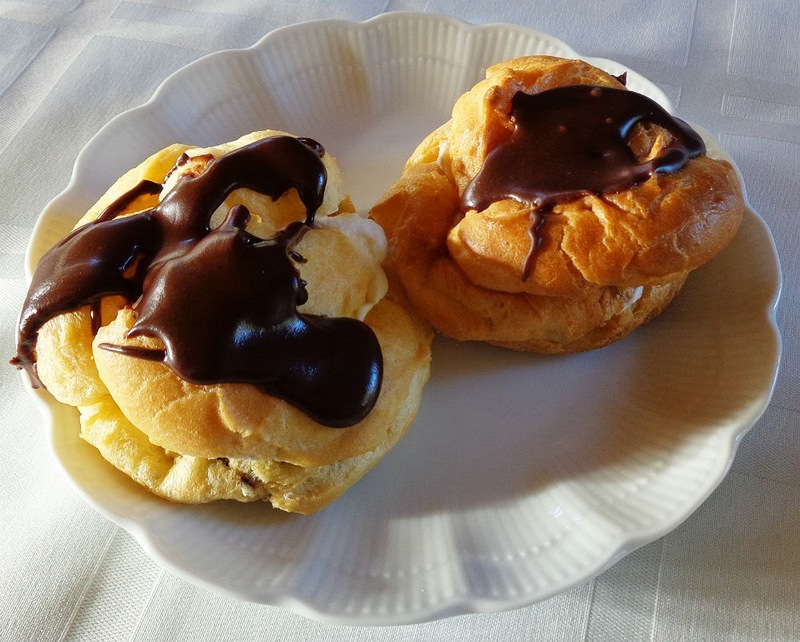 My mother always makes the egg kind, which are made with choux dough. As a result, I have never been able to acquire a taste for yeast buns.